It’s always a little hard to know what to make of Optoma NuForce. On the one hand, they make some of the finest audio equipment around, with a terrific line in amplifiers and DACs that would be at home in any audiophile’s setup. On the other, they produce lines of budget earbuds that, at first glance, seem tailor-made for the impulse buy market. We’d call it an identity crisis, if Optoma NuForce had an identity. As it is, they just…are. They exist. They are a thing. They are a company that makes audio equipment, and while they do it well, they do it with as much personality as a middle manager. All the same, we were curious to try out their BE2 earbuds - while they may be boring, in terms of corporate identity, their equipment has impressed us before. So what would a pair of $50 earbuds from a maker of $2,000 power amps actually sound like? 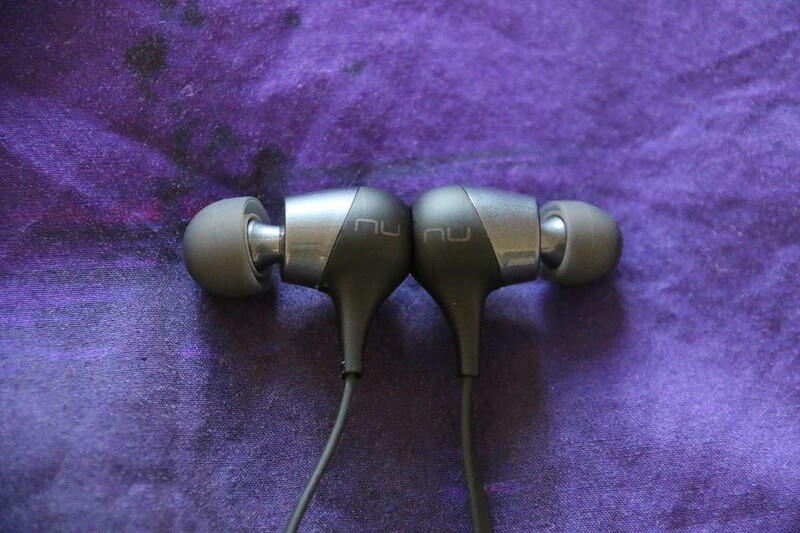 The actual first impressions of the Optoma NuForce BE2 are surprisingly good. They may be a budget pair of earbuds, but they look and feel like they cost a little bit more than they do. The main element of the design that we really like is that housing, which is solid and sturdy. They aren’t made of metal, but it hardly matters, because they feel hefty and well-made. Each one is vaguely bullet-shaped, with the small NuForce logo discreetly printed on each side. The actual tip itself is precisely angled. One of the things that Optoma wanted to do with these particular buds was evolve their existing range, and combine the best features of their sports earbuds with those of their lifestyle buds. To that end, the BE2s have at least one feature we wish that more earbuds would have: a magnetic backing on the housing, meaning you can snap each side together. It’s a feature taken directly from the Sport Be3 (full review here). It worked incredibly well then, and it works incredibly well now. It’s one of those features that you didn’t know you needed until you actually encountered it, but the ability to secure the buds when they are hanging around your neck, and stop them flying off, is amazingly useful. Outside of that one feature, the actual design of the headphones is surprisingly muted. You get a choice of two colors – black-and-white, more evidence that Optoma really, really need a corporate rebrand. The cable itself is thin and rubbery, and short enough for you not to have to worry about tangles – something that never happened in all the time we were using these, which was a pleasant surprise. Close to the right earbud is a slim, pill-shaped in-line control unit, with clicky, easy-to-find buttons and a USB charging port hidden away behind a tab. So far, so good. But when we started using the buds, we came across something that was so utterly bizarre that we couldn’t explain it. And it has to do with that in-line control unit. With three button control schemes, like the one employed by these buds, there’s now an accepted method of how things are going to work. You’ll get two buttons to raise and lower the volume, and a single button to handle everything else: play, pause, track forward (two clicks) track back (three clicks), and answer calls. There’s a reason that 90% of the headphones on the planet use that particular configuration. It works. It’s intuitive, easy, and only ever needs to be explained once. So which genius at Optoma NuForce decided that instead of skipping to the next track, two clicks on the middle button would make you redial the last number? Fortunately, that area is the one lone design flaw that these earbuds have. And while it is a big one, it doesn’t ruin the experience. That’s because, for the most part, these headphones do everything really well. They have small clever touches – not just the magnetic snap function, but also the built-in clip on the cable that means you can stop them flapping around while you’re on a workout. Unlike the shirt clips that come with many other earbuds, this one is actually locked to the cable, so you’ll never lose it. And the buds themselves are rated IPX5, meaning they will quite happily withstand sweat and moderate rain. We tested these on several vigorous workouts, and they performed very well. Battery life is good, if unspectacular, at ten hours – and the buds charged to full in less than an hour. It’s a big improvement on the far more expensive Jaybird Freedoms, making these ideal for travellers or those who go hiking, for example Bluetooth connection was straightforward and dropout free; while there may not be aptX functionality, we didn’t have a problem getting them to work with multiple smartphones. It’s a real shame about that middle button nonsense. These earbuds are so well-designed, with so much to recommend them, that it’s a shame to see them flub that. All the same, if you can live with it, these really do showcase just how much Optoma NuForce’s product designers know their onions. With earbuds like these, it’s all about isolation, and about finding the correct fit. One of the things the Sport Be3 did was packaging a zillion different styles and sizes of tip, which, while initially confusing, meant that we were able to find a good fit very quickly. With the BE2, you get far less than that. You get three different sizes of regular ear tips, and two SpinFit tips. While it does seem a trifle parsimonious, it’s not a deal breaker, and we were quickly able to find a fit that worked for us. And once we’d done that, we were left seriously impressed by the isolation here. The comfort and fit was fantastic, and once the earbuds were in, they stayed in. It’s another big thumbs up from us, which is good, as it’s something we were worried about. In any case, it’s definitely worth getting yourself a pair of Comply memory foam eartips. We shill these to people every chance we get, because if you use earbuds or in-ear monitors, they will make your life so much easier. Trust us. Any pair of earbuds with good isolation is going to have good sound, almost by default. At the very least, it’s a solid foundation the audio designers can build off, as it means that very little can get lost. And although these buds are very cheap indeed, we were blown away by just how good they sounded. They aren’t going to trouble in-ear monitors like the Audiofly AF1120 (full review here), but it was still amazing just how good these sounded. The first impression was one of an easy, confident balance – not quite reference grade, but definitely neutral enough to present all the elements of the track with a good deal of clarity. Every aspect of the frequency spectrum felt tight, compact, and clean. We were particularly taken with the bass; while it didn’t blow our eardrums off, it was definitely present, and felt like it packed more weight and depth than earbuds that cost quite a bit more. One of the things we like to do with any audio equipment we tested is to throw different genres at it to see what sticks and what doesn’t. Sometimes, difficult genres like heavy metal are completely mangled by the equipment, with the dense lower frequencies muddying up and becoming almost unbearable. It’s a particular problem with cheap equipment, and even more in particular, with cheap earbuds. Not here. While it didn’t raise the bar, we never had any problem picking out the elements of even a very dense metal track. Kick drums had plenty of snap, and electric guitars plenty of bite. The soundstage, while again not raising the bar, was also much better than we expected it to be. While it would be wrong to say that it was a million miles wide, it definitely put the instruments in their correct places. Interestingly, we found that these earbuds treat vocals really well – and not just in music. We listen to podcasts while we work out, and we were often struck by just how much definition and clarity the voices had. To be clear: we are not suggesting that these are world-beaters. They simply don’t have the construction quality and internal tuning to be able to compete with the really big dogs. But the 6mm drivers do a splendid job, punching way above their weight class. These very quickly became our go-to earbuds, and if you’re into good sound on a budget, we highly recommend them. Well, what were you expecting for fifty bucks? A velvet carry case? Accessories at this price range are minimal. Outside of the simple plastic pack of ear tips, you get a very short USB-B charging cable. The good news is that if you lose it, any other compatible cable will work, so you don’t have to worry about sending off for a replacement. All the same, it would have been nice to have some sort of carry case included here. Packaging is unremarkable, with the earbuds positioned and presented in a shaped cardboard box. Nothing you can’t chuck out, nothing would particularly be interested in keeping. Just remember to recycle, folks. We were very tempted to tell you to ignore these earbuds, just purely because of the middle button thing. It’s that annoying. It’s one thing to have a feature that doesn’t work as well as it should, quite another to have one but almost wilfully seems intent on messing with your day. But on reflection, we are going to recommend these. They offer far more than you’d expect, as an absolute knockdown price. There’s only one thing to really dislike about them, and plenty of others to enjoy: great isolation, splendid sound quality, nifty features and design, good battery life. They are almost everything we want from a pair of budget earbuds. While our tastes will always run to the slightly more audiophile, we were, as we mentioned, curious to see what Optoma NuForce would do here. What they did was create something that was far better than it had any right to be. A thumbs up from us. These are far more focused towards workouts, where the BE2s tend to be all-purpose earbuds. Obviously, that makes them a more active alternative, but they have other differences, as well. We’ve been promised a set of these to review soon, but from an early listen, we can say that they are far more focused on audio than the BE2. As you’d imagine with three sets of drivers, the quality is superb. The interiors are expertly tuned, and they are the first headphones in the world to be THX-certified. While you definitely won’t want to be using these in the gym, they are ideal if you want excellent sound at a budget price. Focal’s goal? Take over the world of headphones, from ultra high-end audiophile models to the tiniest earbuds. We spent a month with their Spark and Spark Wireless recently, and came away impressed.